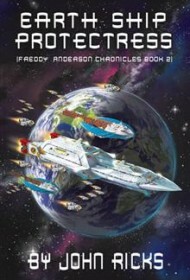 John Ricks’ second Freddy Anderson book pits the precocious boy genius against a giant asteroid headed toward Earth. Freddy, a telepath, has been captured by aliens who peer into his thoughts to learn more about him and his race. The book is told through his memories, and each chapter ends with the aliens’ musings on the information they gained. Since the previous book, the 11-year-old has been building shuttlecraft for space travel, but upon discovering that an asteroid is headed toward Earth, must equip these vehicles with weaponry. The majority of the plot involves the Navy SEALs who guard Freddy—all women—training to operate the shuttlecraft and Freddy prepping to destroy the asteroid. As Freddy and his team race to save Earth, the end provides a surprising twist that seems to set up a third book. Freddy is a fully developed character: He can talk shop with the best of NASA and the president but still shows glimmers of typical adolescent behavior, such as whining and playing practical jokes. Detours from the main plot showcase Freddy’s range of telepathic powers, but often seem superfluous. For example, Freddy speaks with two ghosts who request that their bodies be properly buried. They had died years earlier in a rockslide accident and have haunted their town ever since. While two chapters are dedicated to this segue, the actual burial takes place in one sentence, and the subplot is never revisited. Dialogue dominates the book often at the expense of exposition, with Freddy speaking in especially long paragraphs. Additionally, many contrivances undercut believability: For example, when it becomes clear that Freddy’s ships will need to travel for two years, we learn that just by luck they can generate and recycle water and air, making the feat doable. Overall, Earth Ship Protectress offers an interesting premise, but it asks its readers to suspend too much disbelief, resulting in an unsatisfying reading experience overall.